Even though this book came in a black cover, it could for all I know be pink. It is so sweet, the story but also the characters. I had a laugh with this book. 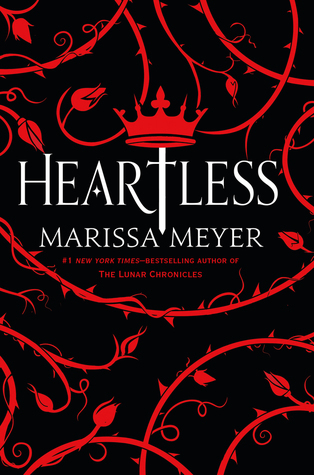 I give Heartless by Marissa Meyer four out of five hearts, because I enjoyed myself a lot while reading this novel. I would have liked to finish this book much earlier, as in last year, but was not able to get my hands on it for some reason. Heartless is, like you probably understand, the story of how the Queen of Hearts got to be the Queen of Hearts. I really liked reading about this normal girl with a cute hobby (I love baking too! ), that loses the love of her life to something so stupid. I felt so for her and normally this behavior would annoy the crap out of me! The story was simple and not too difficult to keep up with. I liked reading something like this for once. It has been a while since I read something this easy. No whiplashes because of plot twists and other weird things. But I did enough it never the less. Knowing it was the story about the Queen of Hearts I felt surprised about the characteristics of Cath. She is so soft and nice at the beginning of the story (of course that changes, we all know where she ended up). Jest is, for me, the usual jester one would expect and I liked that about him. Normal jesters feel forced most of the times in books, but this one is a nice fresh man. I enjoyed the pieces he had together with Cath and his quest made me curious about his own land. Maybe Marissa could write something about his land next? Who knows. I enjoyed the smart references to other things and the Alice books a lot. Some were so cute! They made me laugh and really made me stay focused on the book. The story line was very clever and really emped my 3 hearts up to 4. Well done Marissa! I would advice everyone to read this book, especially if you have already read the other books by Marissa Meyer or if you love Alice in Wonderland! This entry was posted in Book Review and tagged Book Review, Drama, Fairy Tales, Fantasy, Marissa Meyer, Romance. Bookmark the permalink.